Summary: This series of scenarios for planning professional development programs can serve as thinking and discussion guides for site leaders working with teacher leaders who are developing and delivering professional development. The scenarios guide leaders through a process of considering multiple brief PD requests, how they would put together a team of teacher leaders well positioned to respond to the requests, what materials and resources they would need to deliver the PD, and what protocols and approaches they might use. years experience teaching, years experience facilitating, and grade levels. What will you need in terms of materials, resources, and support? You are leading a “Writing Across the Curriculum” Professional Development for a middle school in safe harbor. The teachers are participating from 1-3 pm on three consecutive PD Fridays. Choose one anchor text or reading to feature in your professional development and a protocol to unpack it. 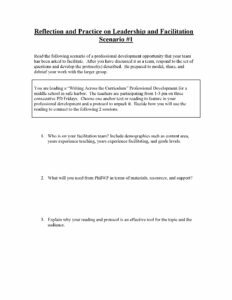 Decide how you will use the reading to connect to the following 2 sessions. Plan a workshop series on conferencing in Writer’s Workshop for 5-8 grade teachers from four schools managed by the same EMO. Many of the participants are content area teachers (math, computer science, science, social studies, literacy, health, etc.). The PD will take place from 1:00-3:00 over a series of a four week period. Select a reading that will challenge the group’s understanding of Writer’s Workshop. Plan an activity/process about peer conferencing for the group. Plan a workshop about writing portfolios for teachers at a K-8 school. Many teachers at this school have already begun to keep writing work folders with their students. The workshop will take place from 9:00 until 12:00 one morning in August. Plan an activity/process about how to use the portfolio process as a teaching tool across the curriculum. Select a reading that they may take with them to inspire/guide them after the professional development is over. Plan a seminar on integrating writing into test preparation. The participants are 20 teachers in grades 3, 5, and 8 from four underperforming schools in the Penn Partnerships area. The teachers have been required to attend. The PD will take place on a Friday afternoon from 1-3. Develop an activity that will unpack their perspectives on test preparation and that will lay the foundation for your subsequent work. PhilWP has invited and received RSVPs from 30 teachers interested in creating writing centers within their schools. Plan a checklist of questions for the teachers to answer towards effective implementation; select one or two connected readings; and one activity teachers may use to create staff buy-in. This seminar will be hosted at the PhilWP office and run from 9-1.